Awhile back I decided to add a "how to video" to my Ring Guard site to help customers with our product. It was a short video and I decided to use youtube and embed it on my site. There were many reasons why I went with youtube at the time. Youtube also generates insight reports (I've mentioned them before). Wonderful reports full of information that anyone marketing their product wants to know. My favorite insight is "Hot Spots". The ups-and-downs of viewership at each moment in your video, compared to videos of similar length. The higher the graph, the hotter your video: fewer viewers are leaving your video and they may also be rewinding to watch that point in the video again. 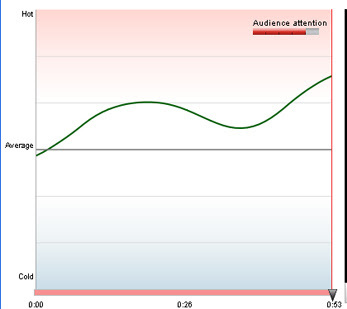 Audience attention score is an overall measure of your video's ability to retain its audience's attention, compared to videos of a similar length. Your video plays side by side as the graph shows you at which point you're losing viewership. It offers you a chance to edit your video to keep the graph in the "Hot Spot". Make sure your full message gets across and help people make the decision to purchase. P.S There is even insights into how much of a "viral" effect your video produces. Don't you love it?